Forgive me for saying this, but that’s a bunch of bull poop (I’d use another word but I’m a pastor). Disney taught us that all stories follow a similar pattern. Once upon a time, there was a person, who goes through a bit of conflict, is rescued by their hero, and they all lived happily ever after. It’s the fairy tale ending. A frustratingly false statement we all wish was true. The ending we want to write for every story, including our own. It’s why we hate any story that ends otherwise. We want to walk out of the movie theater feeling good. We want to put down the book with happiness in our hearts. And that’s fine because part of the reason we engage in stories is to “suspend reality.” The problem starts when our preference for happily ever after becomes our expectation, to the point that when we don’t experience it, we assume something must be seriously wrong with us. We become angry, hurt and confused. But what if the fairy tale ending is a fairy tale itself? What if Disney lied us? After researching the source of fairy tales, I discovered that most of the original stories have much darker themes and more tragic endings. We just gradually cleaned them up in order to make them happy. As Elena Shapiro explained, “American fairy tales are actually highly sanitized versions of western European fairy tales, scrubbed clean of their gruesomeness by Walt Disney.” There’s even a word for it—disneyfied. We disneyfied our stories to make sure they all end happily ever after, but in real life the story keeps going long after the Narrator proclaims everyone happy. Artist Dina Goldstein thinks it’s time we undisneyify Disney. She created an art collection called Fallen Princesses [you can see it here]. Her toddler was just getting into the Disney princesses while, at the same time, her mother was dying of breast cancer. Goldstein was struck by the incongruity of it all and said she “felt lead to rage against the ‘happily ever after’ motif.” She imagined the real lives of Disney princesses. 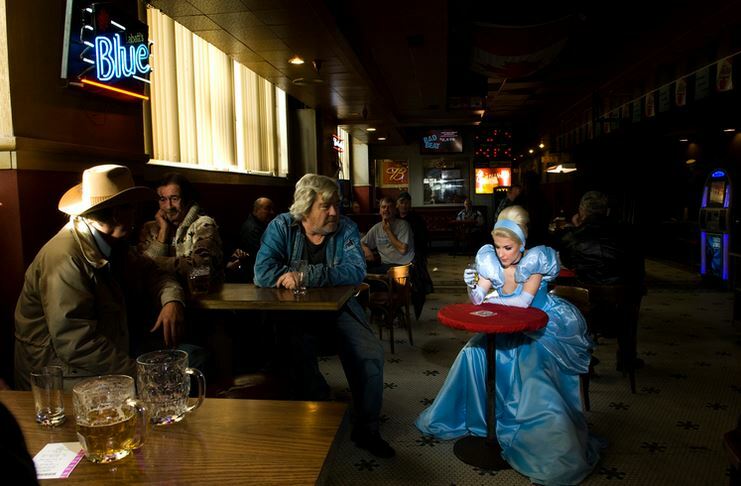 Things like what if Cinderella discovered she couldn’t get pregnant and after many failed fertility treatments turned to alcohol to numb the pain? 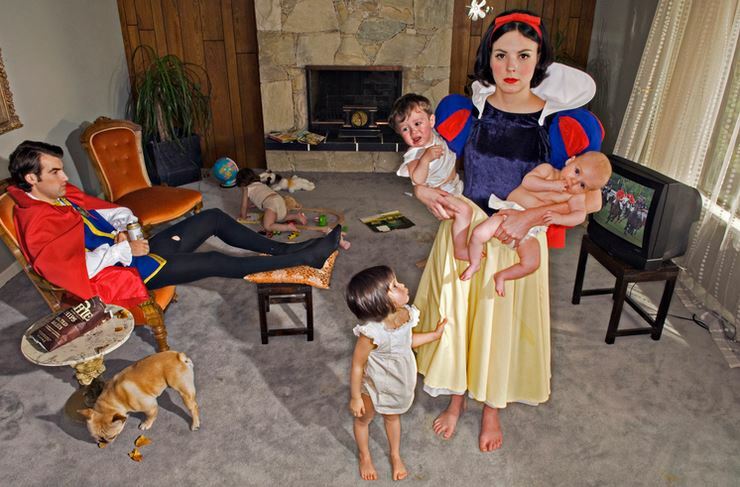 Or what if Snow White discovered that even fairy tale romances fade after four kids? Or Rapunzel lost her hair to cancer? Or Belle lost her beauty? The project struck a chord with many people because it’s more in line with our real stories. It’s life. It’s what we eventually figure out the hard way, but then refuse to share it with others because we’re too busy pretending that everything is OK. But everything is not OK and the sooner we own it, the quicker we can find help and healing. Makes more sense than anyone realizes.